"Would You like to find out more about Lake Garda History?" If you're into History you will find this section very interesting. The Lake Garda History is extremely fascinating and goes way back in time. You'll find out how the Lake was created back in the ice ages, and why it formed into it's particular axe-shape. We'll also briefly go over past battles and ruins around the lake. This area is very rich in history and has more than enough to keep any budding historian happy. So...Are you ready for Lake Garda History to be revealed? The Lake was formed in the Quaternary Ice Ages by a huge glacier. Find out how the formation of Lake Garda by this glacier made it into the shape it's in, and how it caused the fertility of the soil to be so rich around the Lake. 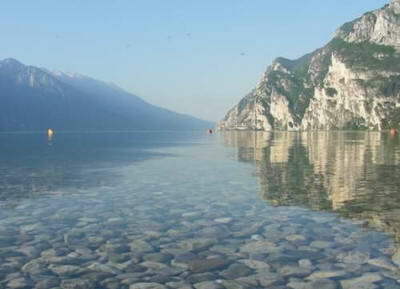 We've researched all the Stats of Lake Garda including the size, depth, and circumference of this largest Italian lake. The first people to settle at Lake Garda (Brescia) did so at about 4000 B.C. and the Romans also had a significant presence in this area. You can find more about the ancient Roman remains and why the Roman flocked to the famous spa found at Sirmione. There are also many other Lake Garda remains and ruins to explore. Read more about Napolean and when and why he was in this area. Learn about how the Red Cross was formed as a result of one of the many Lakeside battles. Find out more about the infamous battle of Solferino where 40,000 soldiers lost their lives in 1859. Also why was Lake Garda such as important place in the history of Mussolini? Discover how so many different countries have occupied land around the lake, which has influenced how Lake Garda is today. Yes in fact the Lake Garda history of its' battles is so significant, it has even affected how the whole of Italy is today! Did you know that one of the classical musical instruments was first invented in a town on the lake. Limone literally means lemon and although the town didn't originally get its' name from the fruit it is very apt as a discovery in 1979 would prove. Until 1931 Limone was only accessible by boat which also lead to a famous medical discovery due to the diet of its' inhabitants. There are many other interesting Lake Garda historical facts. What is your most fascinating historic fact about Lake Garda? Do you love Lake Garda history? Well there is so much of it, you'll see it everywhere! Why not share your story about it and you are highly likely to get your own spot on our website! Your story could well feature on a dedicated web page and may even get in our newsletter too! How good would it feel to show your friends and family your own Lake Garda story on a well respected Lake Garda site! We love pictures as well, so feel free to send us your best shots and there will be no mistaking you then! Please remember we can not receive images larger than 800 X 600 pixels. To check the image size, look at the file details or right click the image and click on properties. Most graphics packages allow you to quickly resize your image to any size and then resave it. Remember to keep the aspect ratio the same (there normal is an option to select this), so your picture is not distorted.